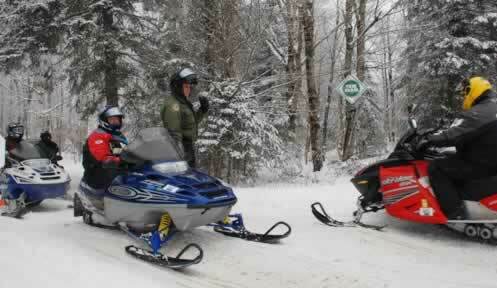 All snowmobiles and OHRVs must be registered if operated in New Hampshire off the owner's property. A registration is a privilege to ride off of your own property on approved trails or with written landowner permission. There are no additional trail user fees in New Hampshire. Is responsible for verifying their registration information and affixing the decals appropriately. Individuals may register at any of the registration agents located throughout the state, and must apply in person. Registrations also may be purchased at Fish and Game headquarters. Note: Annual registrations run July 1 through June 30. New year's annual registrations generally become available in late June. You may request that an application be mailed to you by contacting Fish and Game at (603) 271-4300. Snowmobile registration fees are discounted for members of New Hampshire snowmobile club affiliated with the NH Snowmobile Association (NHSA). The registrant must present, at each time of registration, their membership voucher with their NHSA member number for the corresponding season. To find a club, visit the NH Snowmobile Association at nhsa.com or call (603) 273-0220 (snowmobile club information only). Wheeled vehicle registration fees are discounted for members of a New Hampshire wheeled vehicle club affiliated with the NH Off-Highway Vehicle Association (NHOHVA). The registrant must present, at each time of registrantion, their membership voucher with their NHOHVA member # for the corresponding season. To find a club, visit the NH Off Highway Vehicle Association at nhohva.org or call (413) 200-8061 (wheeled vehicle club information only). Registration fees and current rules are outlined in the current OHRV / Snowmobile Digest of Regulations. There you'll find snowmobile, ATV and trail bike registration fees, rules, as well as other information, such as guidelines for reporting accidents or stolen snowmobiles. Please note that this publication is only a summary of New Hampshire Off Highway Recreational Vehicle laws and current fees; it is not the complete law or rules. The official rules may be examined at: Administrative Procedures Division; Office of Legislative Services; State House, Concord, New Hampshire. The requirement for dual registration of tracked ATVs on snowmobile trails recently changed. At the present time, only a NH OHRV registration is required. The size requirements to operate on a snowmobile trail have not changed. In order to operate on state-approved snowmobile trails, an OHRV (wheeled vehicle) that has had the wheels or tires removed and replaced with tracks, cleats or skis, must meet the definition of a snowmobile as defined by law. The OHRV, with the tracks on, cannot exceed 54 inches in width and 1,200 pounds. Do I need a title or bill of sale? The New Hampshire Fish and Game Department is the state agency responsible for the registration of OHRVs and snowmobiles. The state of New Hampshire does not title OHRVs or snowmobiles, nor does it maintain any records of title or liens on these types of vehicles. A title, bill of sale or previous registration is not required to register an OHRV or snowmobile; however the registrant must be able to provide the vehicle information. Although a bill of sale is not required to register in New Hampshire, when buying or selling a machine, it is recommended that a bill of sale is completed, and includes the vehicle information and VIN. It is also recommended that a buyer verify the VIN on the bill of sale against the machine itself. NH Fish and Game does not verify or give out registration or machine information unless an individual is requesting his or her own registration information. When a transfer of ownership has taken place, the registration and decals on the machine are no longer valid; the new owner would need to register the machine in their own name. The placement instructions are also printed on the decal backing. Have a question about registering your OHRV? Effective May 1, 2018, registrations for the 2018/2019 season, the fee for Annual and 14-Month wheeled vehicle registrations will increase by $30 for individuals who are not a member of a New Hampshire Off Highway Recreational Vehicle club. To receive the discounted member rate, individuals must show at the time of registration, valid proof of membership for the corresponding registration year, to a N.H. wheeled vehicle club that is a member club of the New Hampshire Off Highway Vehicle Association. These fee changes were proposed by New Hampshire’s OHRV community, and passed by the N.H. Legislature. For information regarding OHRV club membership, contact NHOHVA at (413) 200-8061, nhohva.org. The non-member fee increase will provide more funding to OHRV clubs for trail maintenance and new projects. The majority of registration fees go to the N.H. Bureau of Trails, which in turn distributes monies back to clubs for trail maintenance through the Grant-in-Aid Program. Registration fees are also used for safety education and enforcement coordinated by N.H. Fish and Game, which help make our trails safer.